Our last class meeting for Mass Communication Teaching focused on the process of applying for and interviewing for a university faculty job position. Lauri Baker and Jeff Neely, former students from previous semesters in Mass Communication Teaching, were our guest speakers. They discussed their own experiences in applying for faculty positions and offered advice about preparing application materials, phone interviews and campus visits. It was great to have doctoral students in the midst of the process who are willing to share insights and tips. Lauri, who is a doctoral student in the Agricultural Communication program, was just back from a campus interview. She brought with her the notebook of materials she had compiled to help her prepare for the interview. She had information about the curriculum, bios and photos of faculty members, and copies of articles faculty members had written. She helped the class realize the ways that one can be prepared for those individual conversations with faculty members in addition to being prepared for formal presentations. She distributed a copy of a four-page handout that she had taken to distribute that included her teaching philosophy and a summary of her research. We discussed the fact that as a job candidate you can’t count on everyone you talk with having prepared for your campus visit. So having that handout can help remind faculty who you are. She also shared “Questions to Ask (And Be Prepared to Answer) During an Academic Interview,” posted on the Dartmouth Graduate Studies website. The questions also are a reminder to job candidates of the many different people they will be meeting and talking with during a campus interview — faculty members, administrators and students. 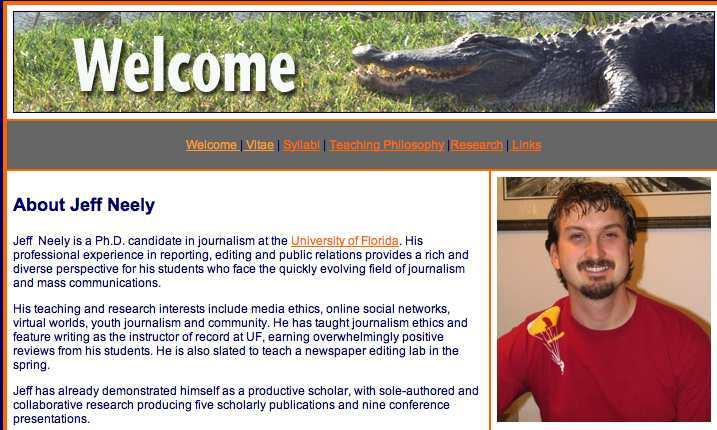 Jeff Neely, a Ph.D. candidate in the College of Journalism and Communications, recently accepted a faculty position at the University of North Carolina/Wilmington. He explained that in his new position, he will be “the journalism department,” as the journalism program is housed in an English/Speech/Communication department. One of his concerns was setting up a teaching schedule that was manageable. He will have a 3/3 load, meaning that he will teach three courses fall semester and three courses spring semester. But he will be teaching two sections of the same course each term, so he will have two preparations and not three. He already has his teaching assignment for Fall 2011 so he can be prepared. Jeff shared a handout of 10 tips for the job process. One of those tips was the advisability of creating an online portfolio. (Both Jeff and Lauri did have online portfolios.) 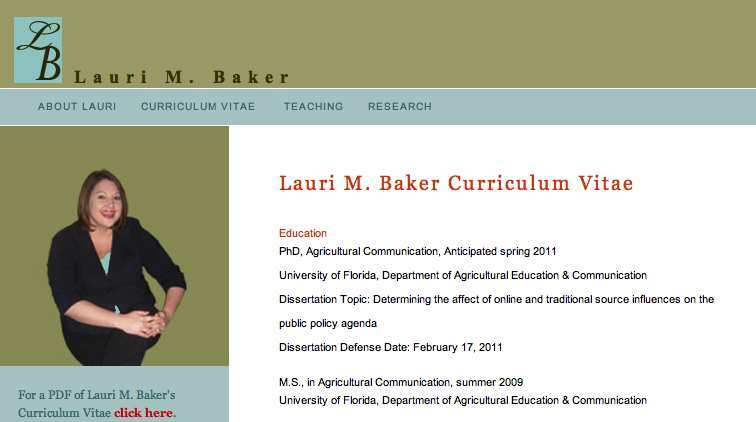 The portfolio includes a bio and photo, the curriculum vitae, teaching philosophy, and other materials (such as samples of research, syllabi for courses taught, etc.). The final project for the students in Mass Communication Teaching is to develop a job application package. They identify a relevant job announcement and “apply for it, writing a cover letter, CV and teaching philosophy. Having Lauri’s and Jeff’s online portfolios is helpful as a reference for this project. And the online portfolios that Lauri and Jeff have began when they were students in Mass Communiation Teaching.